Nestled in the heart of the Appalachian mountains, Charleston offers opportunities for any type of nature lover. Whether long hikes or wildlife viewing, you’re sure to gain a new love for the outdoors in the Kanawha Valley. The Coal River offers a water trail great for kayaking, canoeing in addition to fishing. The river contains spotted and smallmouth bass, channel catfish, striper, walleye and muskie. The Sunrise Carriage Trail is a peaceful and varied landscape of towering trees, wildflowers, ornamental plantings, and historic masonry remains. The trail is 0.65 miles with incredible views of the city. Located in the Southridge Shopping Centre, Cabelas offers 80,000 sq feet of outdoor merchandise including sporting and camping goods. The building is a log cabin and stonework style building with a large waterfall display inside. Rock formations, such as Devil’s Tea Table are quite popular for hikers to discover. Little Creek also has picnic shelters, playgrounds, baseball/softball fields, soccer fields, football field, tennis courts, basketball courts, and an 18-hold disc golf course. Eight trail systems stretch over 700 total miles of WV allowing UTV, ATV, dirt bike riders with a world-class trail system. All trails are open 365 days a year and new trails are being added. Amongst the historical gravesites of city founders, are trees that provide sanctuary for a variety of bird species at the cemetery. Bird walks are held on Sunday mornings during peak migration seasons. At Kanawha State Forest, guided wildflower walks on various trails throughout the forest. Specific hikes include: fall wildflowers, fungi,birds, trees and natural history. Don’t miss this opportunity to learn about the life of the Forest. 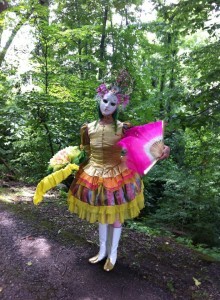 Take a shaded stroll on the charming Sunrise Carriage Trail and enjoy music, dance and art along the way. This urban gardening showcase takes you on a stroll through the Historic East End of Charleston. Visit residential gardens that each serve as a tiny oasis from the hustle and bustle of the busy East End district. The Tour de Coal, a “paddling event” for canoes and kayaks normally held in June, is an 11-mile trip from Upper Falls to St. Albans. Paddlers negotiate the Lower Falls, a one-mile rapid along the route. Spring and fall serve as the best times in the Kanawha Valley for exploring nature. The weather is pleasant and not too hot allowing for longer times outside surrounded by mother nature.